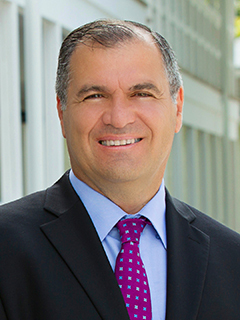 Leonidas G. Bachas joined the University of Miami as dean of the College of Arts and Sciences in July 2010. A distinguished analytical and biological chemist, Bachas was formerly the Frank J. Derbyshire Professor of Chemistry at the University of Kentucky and chair of its Department of Chemistry. Bachas’s tenure at Kentucky was marked by responsibilities and duties across several areas. From 2004 to 2009, he served as associate dean of research and academic programs of UK’s College of Arts and Sciences, participating in collegiate planning, major policy decisions, faculty recruitment and retention, and budget allocation among the school’s 16 departments and 15 interdisciplinary programs. As chair of UK’s chemistry department, he made mentoring young instructors and researchers one of his top priorities. He also made diversity a key objective, spearheading efforts to include in the sciences more women, students of color, and those from economically disadvantaged backgrounds. At UK, he built a strong reputation for fostering interdisciplinary initiatives, heading a research group that brought together biological chemists, materials scientists, toxicologists, and electrochemists to address some of today’s most pressing issues. Bachas earned his Bachelor of Science in chemistry from the University of Athens, Greece, and he holds master’s degrees in chemistry and oceanic sciences from the University of Michigan, from where he also earned his Ph.D. in chemistry. He was also a postdoctoral research fellow at the school.